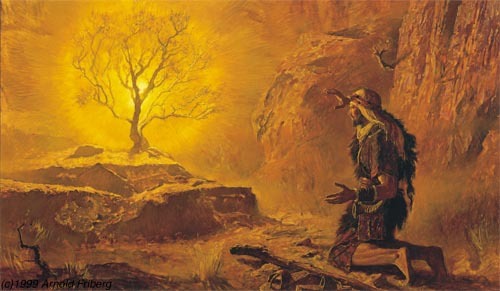 GOD’S BURNING BUSH VS OUR BARREN FIG TREE: LESSONS FOR THE 3RD SUNDAY OF LENT (YEAR C). Rev. Fr. Boniface Nkem Anusiem PhD. My dad was an ardent reader of newspapers during his active years as a civil servant. He never allowed any day to pass by without looking into the dailies. During the working days he got the newspapers from a vendor who was regular at his office, but during the weekends he would either buy on his way from one function or the other or send someone to get from the roadside vendors. As a little boy, I always looked forward to being sent to buy the newspapers because it used to be productive of some remunerations of some sort. On this fateful day he sent me to get some newspapers and added that I should come back as fast as my legs could carry me. I dashed off with joy because I was sure of being asked to keep the change that I already calculated that would come from the newspapers I would buy. Along the street I saw a considerably large number of people cheering and clapping for one man who was carrying out some displays. I stopped running and took a peep. At that point I saw him breaking a bottle of coke and eating the broken pieces with relish and joy. I was stunned and went closer to see what manner of man that could eat broken pieces of bottle without getting hurt. That was not all; he brought out a knife that looked like it was sharpened like a razor and used the knife to cut a piece of wood with one strike; next he tried to cut his neck with the same knife and nothing happened to him. He tried the same on his bare tummy and no drop of blood was seen. Furthermore he brought out a six inches nail and inserted it all the way into one of his nostrils until it disappeared and opening his mouth he brought the nail out! With these amazing happenings I forgot my mission to get the dailies for my dad and pushed my way to see the wonderful sight much closer. Absolved in the “show” I didn’t know when I spent up to one hour feeding my eyes. Unknown to me my dad became worried and sent our male house help Patrick to look for me. On his way he saw the crowd and going closer he saw the “magician” and eventually he also forgot his mission to look for me and joined the crowd to cheer the man. So we were together in the midst of the crowd feeding our eyes and cheering the man who had more “magic” (nay tricks) to show but not knowing that we were in the same place. From my experience with the “tricky man” by the roadside and the experience of Moses with the burning bush one can see clearly the power of the sense of sight. The sense of sight can either build or destroy us; it can lead us onto the right path or onto the wrong path; most people lost their lives while trying to see more and more! For some people the eye remains a window through which many things get into the mind. Like Thomas Didymus (John 20:25) we often want to see and even see more closely! We first consider Moses’ encounter with the burning bush. We all know that Moses fled to the land of the Midian when his fight for the liberation of his people (the Hebrew race) turned against him (Ex. 2:11-15). It happens in life that often your help or assistance can be misunderstood by the beneficiaries. In the land of Midian he got favour from Jethro the priest after delivering his daughters from the hands of some shepherds who tried to stop them from getting water for their sheep. (Ex.2:16-18). From the little from this background we can say that Moses was born to be a leader / liberator and that characterized his life. In the same way each and every one of us has been created for some specific mission on earth and the earlier we discover what and where God wants us to be the better for us. The land of Midian was not where God wanted Moses to spend the rest of his life. Midian for Moses it was a place of learning, a place of preparation in view of the work of liberating the people of Israel from Egypt to the Promised Land. Moses was wandering in the desert before he came to the mountain of the Lord (Horeb) where he had an encounter with the divine presence. This is reflective of our lives. When we are disconnected from God we are no better than wanderers in the desert of sin. However fate led him to Horeb (or Sinai) the mountain of the Lord (the same place he would later receive the Ten Commandments (Ex.20:5ff). Something will always bring you into God’s presence at some point in your life. For Moses it was his duty or employment. If you are diligent in your duty it will turn out to be ladder that will lead you up to God. At mount Horeb Moses saw a bush burning; which was not unusual, but the extraordinary thing was that the bush was not consumed by the fire. What fire does is to consume anything it comes in contact with, but here the bush was burning and nothing was consumed. This was a spectacular sight like the one I saw as a child running errand for my dad. The difference here is that God is at work not some tricky “magician”. Moses went closer to be sure of what he was seeing. Before he could go any further he was called by his name (Isaiah 49:16) and was also asked to remove his shoes as he was standing on a holy ground and he hid his face realizing the fact that he was before the presence of the Almighty God and nobody sees Him and lives (Ex.33:20). Moses fled from Egypt at the age of forty. Forty years later God called him to go back to Egypt in view of liberating His people. We are very much like Moses. Within the forty days of Lent we have been asked to climb the mountain of the Lord with prayers, almsgiving and fasting / abstinence. Like Moses who was asked to remove his shoes we have been asked to put aside those self-sustaining materials and to rely on God as our sure platform. We are reminded like Moses that we are standing on a holy ground (the holy season of lent). As Moses hid his face we are called to hide our faces from evil and also not to go any further close to sin. Like Moses was sent to Egypt by God to activate the liberation of the people of Israel, we are being sent to recover those virtues we lost during the time we wandered away into the desert of sin. God knows that it was not going to be an easy task for Moses so he gave him both the spiritual and physical assistance he needed. In the same way we have a divine provision for our mission; there is unction for us to function this season. We should be confident like Moses because the one sending us is the ever present “I AM” (Ex.3:14). God never was! He is! The mission of Moses to Egypt was a mission that warranted bearing of fruits. The Lenten period is our time of reclaiming the grounds, of planting of seeds that would die, germinate, grow and bear fruits. This brings us to the gospel episode of today which among other things tells us about the parable of the barren fig tree (Luke 13:1-9). During the time of Jesus Christ people believed that those who died by accident were paying for their sins. With this in mind some came to Jesus to tell him about some Galileans whose blood Pilate mingled with their sacrifices. They were like saying: “their numerous sins caught up with them”. Jesus Christ had a contrary view. For him they were not the worst sinners not even those eighteen who died when the tower of Siloam collapsed ranked highest in sin among others. The discussion above provided an opportunity for Jesus Christ to instruct the people about the need to make use of the opportunity one has to repent and come back to God or face the penalty of perishing. Our Lord in his typical way used a parable to make his point clearer. He thus spoke about a fig tree that could not bear fruit after three years and which the owner wanted to cut down but the vinedresser pleaded that it be given one more year wherein it will be given more attention by the vinedresser for it to bear fruit and if it fails then it will be cut down. For three years a fig tree was occupying the ground without bearing fruits. The number three is known biblically as representing completeness. Hence the fig tree had a complete life circle that should be productive of fruits; it was really time up for it to go. But there comes the vinedresser begging for it to be given one more year. What happens in your life after hearing a powerful sermon, what becomes of you after getting instruction from God at Mount Horeb? Do go back wandering in the desert or do you buckle up to go ahead to bear good fruits. There is a relational line running between the burning bush and the fig tree. At the burning bush we are given instructions to work with upon encountering the presence of God and at the fig tree we are expected to bear fruits corresponding to the instructions we already received. The burning bush is the region of God’s presence where helpful instructions are given. We notice that the fire did not consume the bush. That fire represents God’s love that does not destroy us but moves us to bear fruits. It represents God’s burning love to have us saved by giving us another chance, another year to improve on what we have not done well. It is that love that inflames us to get the spiritual manure for fruitfulness. Have a blissful Sunday and a blessed week ahead. ← FROM DISFIGURATION TO TRANSFIGURATIONAL CHANGE OF POSITION: HOMILY FOR THE 2ND SUNDAY OF LENT (YEAR C). Rev. Fr. Boniface Nkem Anusiem PhD. Dee Bonny, thank you. I wish you a fruitful lenten season, as I not only make a turn back to facebook once more, but more importantly & significantly, pray to turn back with my whole heart & being to God this lent. This is also my prayer to all. Have a nice weekend! Cy Duru C.
Excellent sermon.Lord Jesus ,we don’t want ,to perish.